Every January, I launch into a deep state of planning. I can't help it. It's in my nature. I enjoy planning all the things. Organizing all the things. Setting all of the goals. For my personality type, it's a really great way to motivate me and launches me onto a successful path. 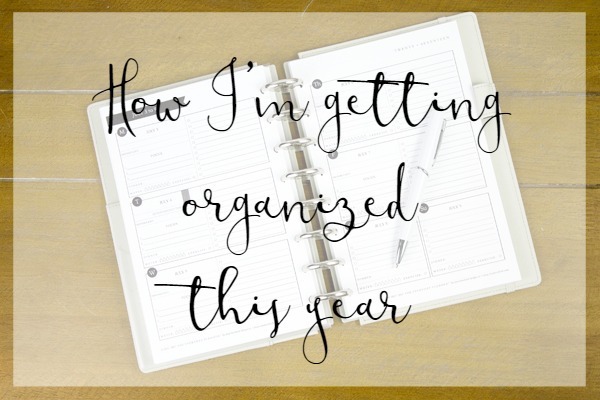 Of course, nobody can maintain that momentum for an entire year, and usually about half way through the year I am moving a little slower and accomplishing a little less. But that's okay because we all need a little recovery time to regain our motivation. And then it gives me the opportunity to have another planning session, which I thoroughly enjoy. This post is in collaboration with Bloom to Brush. This post contains affiliate links for your convenience. For more information, see my disclosure policy. I've enjoyed my January planning mode for as long as I can remember (although when I was younger, it happened in August before school started rather than January). But the year of 2018 sure did let me know big time that something needed to change. Then I had baby number two. I thought for sure it would be an easy transition since I had such a good handle on the first one 😂😂😂 WRONG. Nothing about it was easy!! I suddenly had no time to even pee, much less accomplish goals! Still, in my exhausted, overwhelmed, hot mess mom of two state, I sat down in January and planned all the things. Just like always. And it did help me change my mindset and look at motherhood in a positive light. 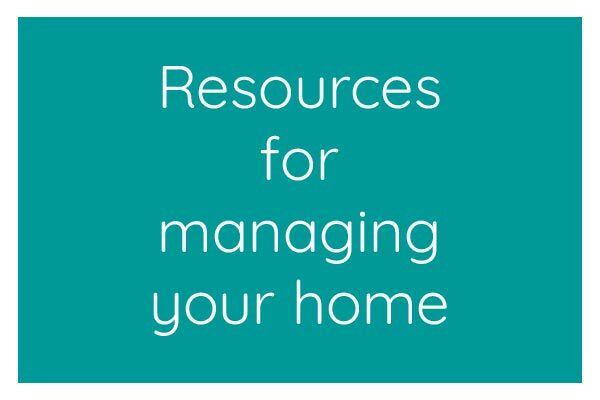 It helped me carve out systems that helped my family and our household be more functional. And planning gave me something fun to do in the midst of chaos and the extra set of dirty diapers. But it also made me feel like a failure. For the first time in my life, I couldn't do all the things. I couldn't check off my to do list. I couldn't be all of the places I needed to be. I couldn't fill all of the roles I needed to fill as mom, wife, homemaker, entrepreneur, daughter, sibling, friend, etc. I couldn't do it all. By the end of the year, all of my planning just made me feel like I was drowning. All of these things I couldn't accomplish were looming over me. I realized that I don't have to stop planning. Because it does bring me joy and it is so beneficial for my personality type. I just needed to change my method. Because motherhood changes things. You have to adjust your lifestyle to meet your new needs. It's a learning process! So in 2019, I still spent January doing a little bit of planning, but I simplified it significantly. I listed things I would like to accomplish for each category of my life, but I didn't make them specific goals like I normally would. No set dead lines. No exact numbers to hit. Just a simple list of manageable tasks. More like guidelines instead of a rigid, structured plan. And then I chose a word of the year. I've never picked a word of the year before. But I thought it might help me stay focused without all of the strict goals. I spent lots of time thinking about which word to choose. Originally I chose "simplify" because I want to reduce overwhelm by simplifying many areas of my life, but the more I thought about it, the more that seemed like a short term word. I could easily make the changes necessary to simplify. After more thinking, I thought of the perfect word. Intentional. It's all encompassing. It covers all of my goals. 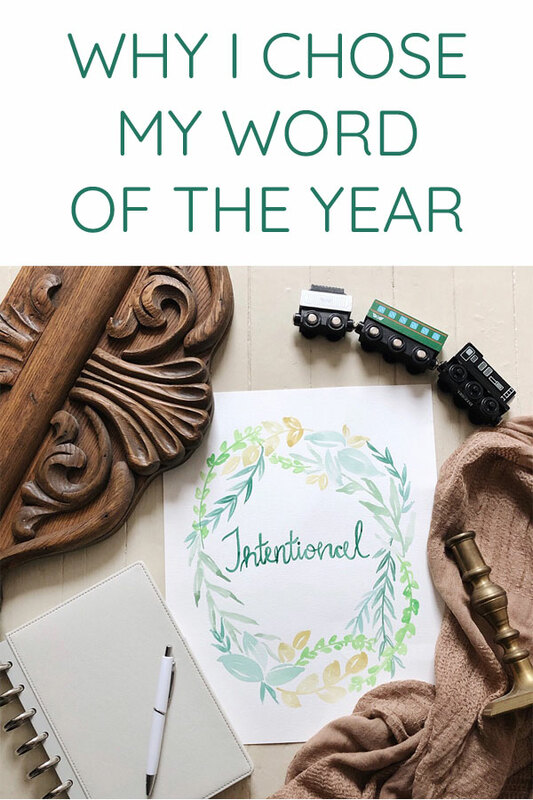 I want to be more intentional with my time- how I spend my time with my kids and my husband, how I spend my work hours, how I spend my alone time. I want to be more intentional with my relationships- I want to carve out more time for my husband and I to have one on one time. I want to work on showing our love for our extended family on both sides. I want our close friends to understand their importance to us. I want to focus on the 5 Love Languages and be intentional about how I show that I care to each person in my life in a way that is meaningful to them, not me. I want to be more intentional about what I bring into my home- getting rid of all the "stuff" we don't need. We can begin with decluttering and organizing what we already have. And then I want to work on editing out the things we don't love and instead bringing in timeless pieces that we will always love and more items that have meaning to us. We both want to live a more minimal and meaningful lifestyle in our home. 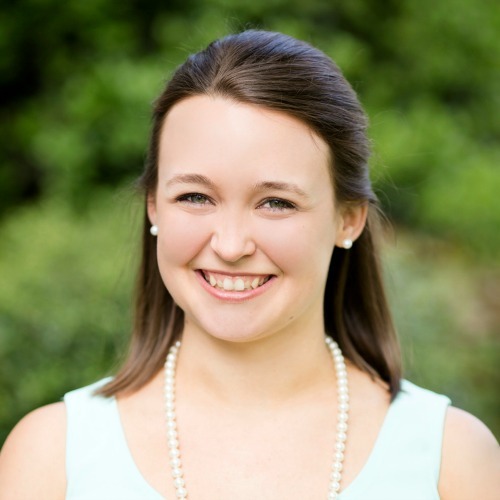 I want to be more intentional with my business- I often lose focus of why I started my blog. It's easy to let it spin into many different directions in an effort to be successful. But I have found over the years that when I share authentic things, that is when I see the most success and also when I feel the most joy in the creative process. I can't please everyone. 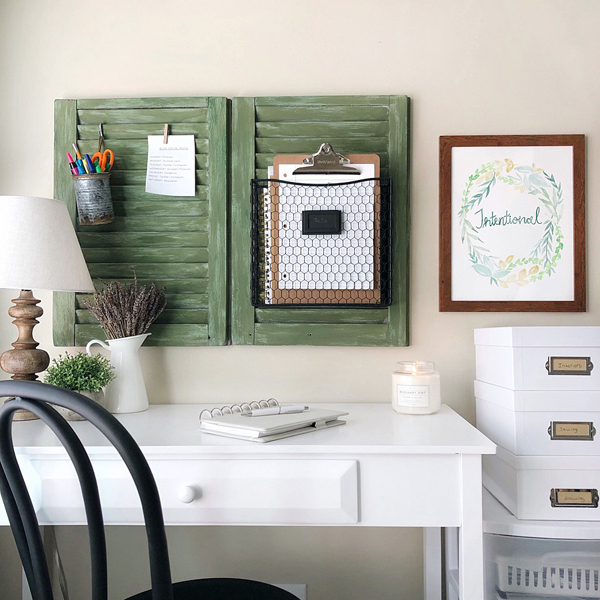 I won't do projects just for the sake of a blog post- I want to only do projects that I would normally do for my home and my style. I won't share things or do projects that don't make sense for my business or don't resonate with my core readers just to try to please the masses. I want to be more intentional with my health- as mother, I often prioritize everyone else in the house before I take care of myself. For instance, when we moved here, I found doctors, dentists, even veterinarians, for everyone before making any appointments for myself. A year and a half later, I still don't have the healthcare that I need. And I'm a nurse! This is a priority! But I'm off to a good start getting myself back on track. I've made a few appointments for myself and have at least done the research on medical providers for the rest. There are many areas of good health that I need to be more intentional about. Intentional. It can represent so many things. To help me stay focused on my word of the year, Natalie from Bloom to Brush sent me this beautiful 11' x 14' watercolor word of the year painting. I did a little mini refresh of my office and displayed it there. 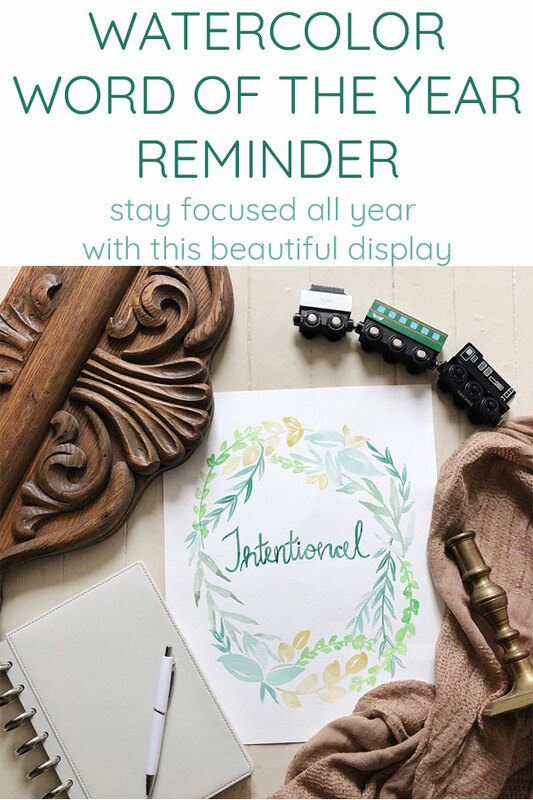 My hope is that being able to see it every day while I'm working, and in a room that I walk through multiple times each day will be a subtle reminder for me to remain intentional with my actions in the coming year. 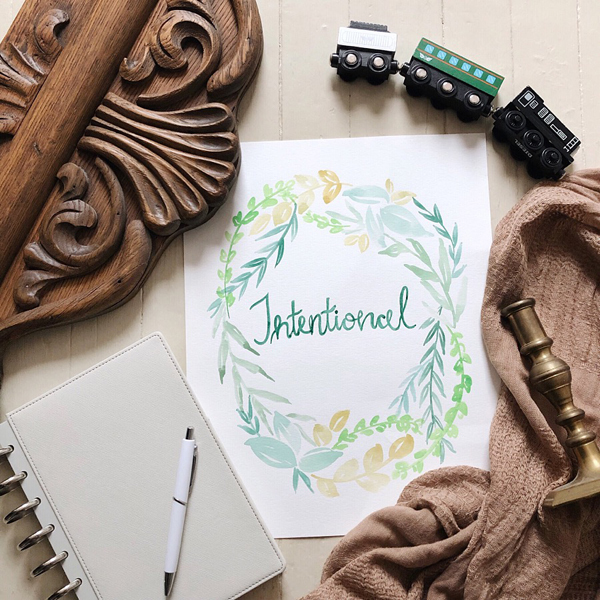 If you're interested in a watercolor painting with your own word, you can use code INSPIREDHIVE25OFF for 25% off before February 1, 2019. She also has some other beautiful works available in her shop!